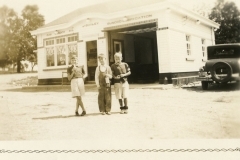 In 1936 my Grandmother, Hattie Bailey opened a concession stand in the orchard between her house at 149 Baldwin Street, N and my Grandfather Jerry’s Sunoco service station at 157. 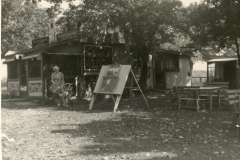 This stand was referred to as “the Booth” and it was from here that Hattie sold sandwiches, beverages, baked goods, candy, cigarettes, ice cream and paintings by local artist Cliff Delong. It was here that Verna Sonley Hodson began to work at the age of twelve in the summers before her marriage to Ray. A neighbour, Mrs Pengally baked pies Hattie sold by the slice and local women brought flowers from their gardens. 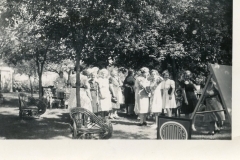 Members of Rebecca Lodge had their tea parties in the orchard and the UCW held quilting bees. 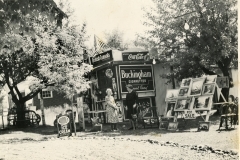 Before closing “the Booth” in 1953, Hattie also operated a concession stand for many years at the Brooklin Spring Fair.